I’m certainly no expert at creating or managing a Facebook page just yet, but I’m getting there. 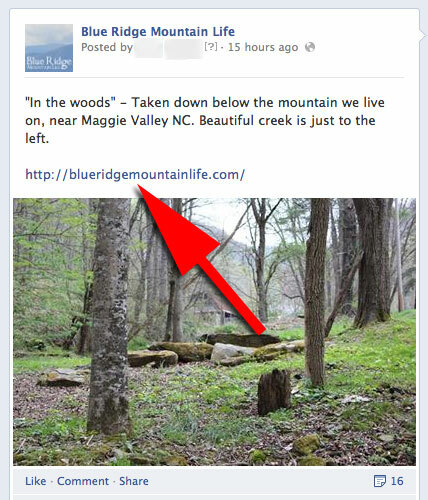 My wife and I decided to create a “lifestyle” website about our life in the Blue Ridge Mountains some months ago, and one of our key growth strategies was to use a Facebook page to drive traffic to it. The strategy worked, and we now have over 18,000 likes on our Facebook page. We found that those likes can really drive a large amount of traffic to our website each day. During our day to day activities on the page, we’ve also run across a number of other very successful Facebook pages, some reaching over 250 thousand likes. Unfortunately, we’ve seen some of these pages making 1 or more of 5 common mistakes with their pages. This one seems to be the most common. Facebook page owners that often have several thousand and more likes and don’t have a webpage to send those followers to. Why is having a website important? Facebook has a number of different Terms of Service items related to earning money using Facebook. 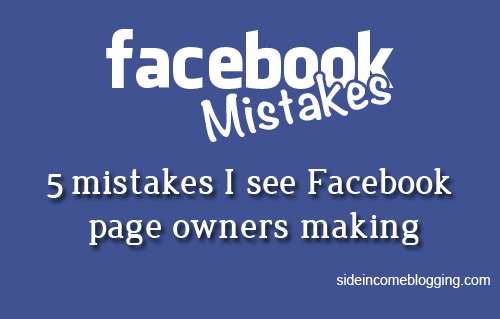 As a result, page owners have to be very careful about what they do, or risk having their pages banned. There are really no restrictions though around sending traffic from your Facebook page to your website or blog, which makes having one critical to earning money and providing additional value to your Facebook “Fans”. Publish longer and more comprehensive articles. Having a website allows you to publish longer and more detailed articles than would normally be acceptable on Facebook. For example, perhaps you recently did some really neat “Do It Yourself” project, with lots of pictures. Traditionally a large article with that many pictures wouldn’t fit well within the traditional Facebook post model. BUT, this project written up on a blog as a “how to article”, then shared on Facebook with a link back to the article with all the details generally does VERY well on Facebook. Advertising revenue. By posting photos, cute sayings, and small text “tidbits” on Facebook, you are certainly providing value to people and increasing your following BUT you are also lining Facebooks pockets with money, and not really lining yours with any. Facebook exposure is limited. Facebook has openly admitted that the distribution of your page content will decline over time. Many of us that own Facebook pages are definitely seeing this trend. About 10-20% of the people that like our page actually see our page content. The 80% don’t. By having a website you can encourage people to visit your website directly, or better yet sign-up for your email distribution list. This gives you direct control over who sees your content and when. Facebook won’t be around forever. While I certainly think it’s a long way off, there will come a day when Facebook won’t be near as popular as it is today, and perhaps even no longer exist. While having 250k followers on your Facebook page is great, once Facebook is gone, those 250k followers are useless. Sending those people to your website, and encouraging them sign-up for your mailing list, allows you to contact and update them, even without Facebook. Some Facebook owners get my first point, and have a website for their Facebook page. The problem is, they don’t tell people about the website often enough! If people don’t know you have a website, they aren’t going to visit it. The single most important thing you can do to get people to visit your website is to tell them the web address. Note that I included a link to our website indicated by the red arrow. I do this for every single Facebook post I make, even when I share other people’s photos. Why? Well, remember, only about 10-20% of your followers see each of your posts. If you don’t put the address on every post, you stand the chance that people may not see the post where you included your website address. Put your website address in your page’s “About” information area. This is the area at the top of your page, where you tell people what your page is about. I’m shocked at the number of people that don’t do this! Watermark your images with your website address. If you are posting an image that you own, put a watermark on the image with your websites address. I don’t always do this, but sometimes will on images I know are going to be very popular. Post links on your Facebook page to articles that reside on our blog or website, and use a photo for the post from the article. I do this for all of my articles, and repeat those posts every few days. Remember, not everyone sees your first post and you should have new followers too your page that need to see your articles as well. Repetition is a good thing. As a semi-professional photographer, this one is a huge pet peeve of mine. I see numerous Facebook pages posting copyrighted images on their pages every single day. These pages almost seem to try and imply the image is theirs – pure stealing in my book. Don’t do this. Not only will you most likely get called out in public for it, you’ll also hurt relationships, hurt your credibility, and you might even get your page banned or have legal action brought against you. Sharing copyrighted images just isn’t worth it, as there are many other beautiful images that are sharable. My “Golden Rule” is that if you aren’t sure if the image is copyrighted and/or sharable, don’t share it. Be extra careful sharing images from other Facebook pages where there is no image attribution too. Instead, find images that are sharable under the “Creative Commons” license and share those. Additionally, many photographers are on Facebook and allow their images to be shared, with the appropriate credit of course. Finally, if you find an image that you really want to share, but aren’t sure if you can or not, just contact the photographer and ask. In many cases, they will let you share the image. Getting explicit permission is not only respectful, it may keep you out of legal trouble too. I’m not going to go into a great amount of detail on Facebook Insights, as there are plenty of good articles that do, but I will strongly advise you to learn about Facebook Insights AND pay attention to them. Facebook Insights will show you what posts your “fans” like, and which ones they don’t. If you spend a little time each day reviewing insights, you can learn what to post and what not to post. The magic formula for success using Insights? Post more of what your fans like, and less of what they don’t. Yep, it’s just that simple. Unfortunately, I’ve spoken to a number of Facebook page owners that don’t look at their insights and don’t use it to drive what to post and what not to post. Don’t be that guy or gal – use the tools available for you. Last, but certainly not least, is that I see Facebook page owners making the same mistake that many new bloggers make: They fail to understand the importance of relationship building. Let’s say you have a brand new Facebook page. You have 10 likes (all your family and friends), but you want to really get your page to grow. The best way to do this is to start sharing content from other successful Facebook pages. This alone might get you on the Facebook page owners radar, but commenting on their page or even better, sending them a message to introduce yourself, is FAR more effective. Now, that is just sample – please don’t use that verbatim, as adding a personal touch is really important. But hopefully this gives you an idea of what I mean. I personally work hard to build positive relationships with other page owners that have pages related to ours. More importantly, I really focus on building relationships with photographers, as they provide the majority of the content I share on my page. Just because we’re in the modern days of the internet, doesn’t mean that good old fashioned relationship building no longer applies.